In my last post I featured the new proposed trail system for the Royal Gorge area designed by the Truckee Donner Land trust (TDLT). I commented that most of the feedback I had heard was positive and supportive of the multi-use policy that TDLT has adopted for the area. I would be remiss however not to mention that there have been some concerns by some about the trail plan. Most of the concerns center around potential trail conflicts between different categories of users, ie: hikers vs mountain bikers vs horses. I am not going to address the issues of trail conflict because I believe that the final implementation of the TDLT plan will go far to alleviate these problems. There is however another concern that has been raised concerning the impact of the trails on the drainage into the Serene Lakes watershed. 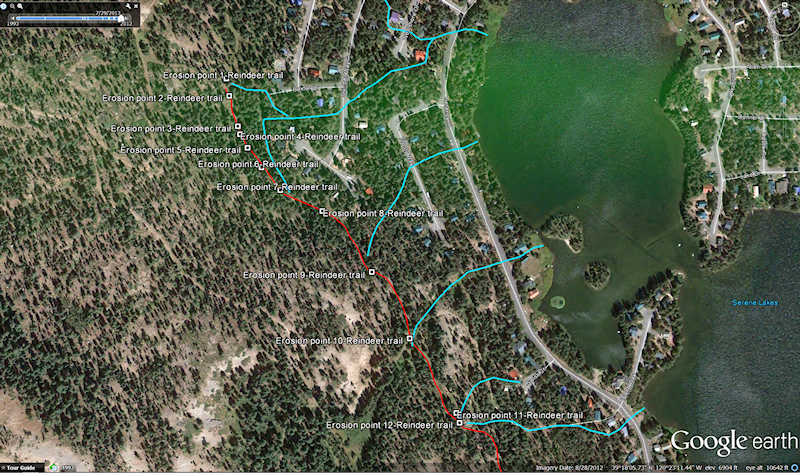 Specifically, the concern has been raised that mountain bikes on the trails closest to Serene Lakes will cause increased erosion damage resulting in an increase in sediment going into Lake Serena (the water supply lake) and Lake Dulzura. Just so you know where I am coming from I want to make it clear here that I am a mountain biker and have ridden the trails in question for the last 15 years that I have lived on the summit. While I favor the use of the trails in the area by mountain bikes, I am also concerned about the impact of mountain biking on the environment and the local watershed. With this in mind, Linda and I went out last week and did a visual survey of the Reindeer/Switchback trails that cut across the watershed drainage. The purpose of the survey for us was to identify the potential erosion points on the trail and create a visual survey of them that would show the current status of the trails to enable an assessment of what remediation actions might be necessary. I have made the survey available for download for anyone that wishes to examine the status of the trails for themselves. While I do not claim to be a certified trail expert, I have spent many years hiking and biking in the area and I felt I could draw a few common sense conclusions. The trails are in relatively good shape and pretty resilient considering that they are remnants of old logging roads that were never designed for trail use and have been neglected for years. The amount of erosion on the trails is small and the contribution that it would make to the watershed drainage is miniscule compared to the total drainage of the area (see the Getting Some Perspective slide in the survey). There are a few erosion points that are problematic and could be enhanced by mountain bikes, but remediation measured planned by TDLT should mitigate any enhancement effects by mountain bikes. Please don’t take my word for it, however. I have produced this survey so that everyone can see the erosion points for themselves. I urge you all to take a look at the survey and draw your own conclusions. And if you want to see it first hand, you can always go out and take a hike around the lake. One Response to Not so happy trails? I’m am LOVING your blog, which I recently discovered. I’m the newbie on the Summit and learning to take it all in at the same time as falling in love with the mystique. Your blogs are interesting and well-written. Thanks for the many contributions…so appreciated!